Blog Well Done | Good Food. Good Fun. Well Done. Good Food. Good Fun. Well Done. Get Your How to Make Tofu eBook FREE! This week’s CSA saw an almost too-colorful-for-words bounty of produce (as you can see) and an ingredient that made me probably just a little too excited: kielbasa. I like kielbasa. Like a lot. Amongst the realm of sausages, kielbasa edges out bratwurst and sweet Italian as my favorite. In fact, if it were me, I definitely would have just grilled up the kielbasa, threw them on the egg buns, added a little pepper relish and mustard and gone to town. My wife, on the other hand, offered to make German food. So…we ate German food. Now, if you’re not sure what spaetzle is, it’s a German noodle (is probably the best way to describe it), but it’s got a more a dumpling-like consistency. They have a flavor kind of like a biscuit, but their small size means they cook quickly and, when you fry them in butter, get very firm on the outside and a pleasant, nutty flavor. First, start the kielbasa and onion cooking by tossing the sausage, onion, and olive oil in a skillet over medium heat. Stir occasionally. When the kielbasa is done cooking, add the cabbage and another pinch of salt. This will happen at some point while we are making the spaetzle. Now, make the spaetzle by mixing the dry ingredients together in one bowl and beating the eggs in a second bowl. Alternate pouring a little milk and a little egg into the dry ingredient bowl, mixing the entire time. Continue until the milk and eggs are gone. Bring a pot of salted water to boil over high heat. Use a spaetzle press or push the dough through a cheese grater with large holes to make the spaetzle. Add to the water. Repeat until all the dough is in the pot. Cook for 3 minutes or until the noodles are floating on the water. Once the spaetzle is done, drain and let sit until the cabbage is done cooking. When the cabbage is done, add the spaetzle to your skillet and make a hole in the center. Add the butter and let it melt, then stir so that the butter coats as much of the spaetzle as possible. 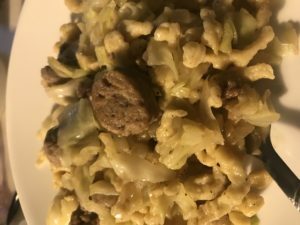 Cook for another 2-4 minutes or until the spaetzle is slightly firm, give it a good stir to mix with the cabbage mixture. Oh, and as before, Hen House has supplied me with the produce from the CSA, therefore, this qualifies as a sponsored post. Why Have Veggies When You can Have Gravy? Well, week 2 is in the books and as you can see, Hen House has provided an amazing array of produce again! The Napa cabbage was crisp and perfect, the radishes red and firm, and the tomatoes were rich and juicy. So naturally we decided to make biscuits and gravy. 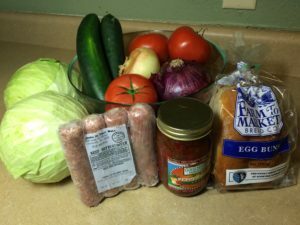 I had thought about taking the Napa cabbage and sausage to make some American spring rolls. Use the tomatoes and egg buns for a little panzanella, and marinate the radishes to make pickles. 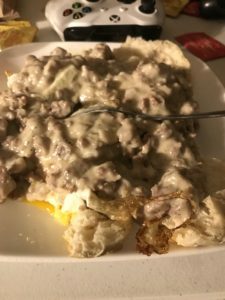 My wife wanted biscuits and gravy. So, we ate biscuits and gravy. Preheat oven to the temperature indicated by the Grands pop can. Put the sausage in a skillet over medium-high heat and brown until all trace of pink is gone. Once the sausage is ready, check to see how much grease is left in the pan. If there is at least a tablespoon of grease, you can omit the vegetable oil. If there is less than a tablespoon, add the olive oil and let it get hot. Add the flour to the grease and stir to make a paste. Add the milk and whisk until your flour paste is well-incorporated. At some point during the gravy cooking process, the oven will be preheated. When that happens, liberally cover a baking sheet with cooking spray. Put the biscuits on the baking sheet and bake according to package directions. Simmer the gravy until the biscuits are done, check for salt and pepper and serve. * Yeah, I get it. Grands aren’t fancy, but it’s also hard to beat when you’re putting together a quick dinner, either. If meat isn’t your thing, you can replace the sausage in the recipe above with Morningstar Farms faux sausage (which you can buy at Hen House) and an extra tablespoon of vegetable oil. You will first chop and then brown the Morningstar Farms sausage in the vegetable oil and then proceed with step 2 as normal. Slow Cooked Good Natured Family Farms Chuck? Sure! Remember last time we talked about the Hen House CSA? Well, now we’re going to get serious. What are we going to do with all our take! If it were up to me, I’d go with an intense Asian flavor base: soy sauce, ginger, garlic, rice wine vinegar, bean paste, diced red pepper, celery and bok choy. This would be served over a bed of egg noodles and a side of green beans sautéed with few drops of sesame oil. There’s only two problems with that: one, my wife’s not a fan of that flavor profile and two, in the CSA was some lovely chard and kale that I’d like sauté and serve with the roast. So, we’re going to go with a more American flavor base. We keep the soy sauce (for the umami) and garlic (because it’s garlic.) We’ll add just a little black pepper, a light dusting of herbs and a little lemon to round out the taste. On the side, I’ll sauté the greens in olive oil and season with salt, pepper, and garlic. Combine a liberal amount of salt and pepper and flour. Coat the entire chuck roast in the flour mixture and let sit. Add the olive oil to the skillet and let it get hot over medium-high heat. Cook all sides of the roast for 45 seconds or until brown. Place the meat in a Dutch oven, ceramic pot or your crock pot. Add the garlic, herbs and lemon to the stock. If you are using a crockpot instead of a Dutch oven, set the crockpot for low and cook 8 hours. Flip the meat halfway through. If using a Dutch oven/ceramic pot, bring the liquid to boil over medium-high heat, then cover and set the heat to medium-low. Cook for 3 hours, flipping the meat occasionally and ensuring that the liquid continues to boil gently. It’s been a while since the Blog Well Done family has been part of a Community Supported Agriculture (CSA) program. 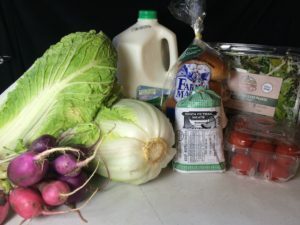 If you’re not familiar with CSA programs, you basically buy a share of a locally-owned farm’s output in return for a guaranteed amount of their output during the season. The farm’s happy because they have cash flow and your belly is happy because you get some good vittles. 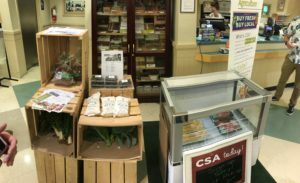 Anyway, for years, Hen House has been featuring a CSA program that’s a little different than the CSAs we’ve joined in previous years. 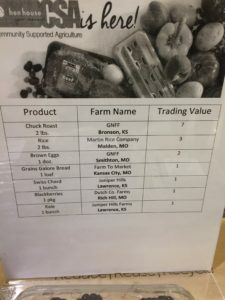 Their CSA program allows you to take shipments of several different local producers offering not just vegetables and fruit, but rice, meat, eggs, and other items, too. I like the program a lot because it allows me to try different items from local producers that I might not otherwise eat. It also has helped the BWD family overcome our biggest objection to the CSAs of old: lettuce. No, seriously. Our past CSA delivered us a lot of food we really like and a whole bunch of fancy lettuce we absolutely wanted nothing to do with. See, Mrs. WellDone loves salads, but doesn’t like bitter lettuce and I’ve always felt that lettuce isn’t food. Lettuce is what food eats. With all that said, the next few months are going to be delicious. I was already pretty enamored with Good Natured Family Farms’ meats (I have no affiliation with them, by the way, I just like their stuff.) Now, I get to eat a lot more of it every week and tell you all what I did. So please check back. There will be plenty to enjoy! Pay for Coffee with a Kiss! The only catch is that you have to bring in someone to do the kissing. I’m not sure kissing your local barrista counts (thereby dashing my hopes for a free smooch and a free coffee) since they want to snap a picture of you and your lucky significant other before you get your coffee. While this may sound unfair to those who are single, my guess is there are plenty of caffeine addicts who would be more than happy to lock lips for a free cup of joe. And who knows where that could lead? Maybe at Metro St. James there’s more than coffee in the air. Maybe there’s love? Maybe not? Well, at least there’s still coffee. Happy National Cheese Day Everyone! Yep, for the next hour and fifteen minutes on the West Coast, it’s National Cheese Day, which, if we Americans would step up to the plate, would be the greatest holiday ever. Well, maybe second next to National Chocolate Day. Well, needless to say, it’s late and I’m a bit punchy, but it’s okay because all this zaniness has got me thinking about late night snack food. A lot of my late night favorites: pizza, nachos, burritos, or just cheese and crackers couldn’t be possible without cheese. So on this National Cheese day I’m going celebrate indigestion late night snacking with a little quick-fix cheesy snack. It’s something to feast on while I watch The Walking Dead which in no way puts me in the mind to eat anything. On the other hand, when Zombie Cupcakes: From the Grave to the Table with 16 Cupcake Corpses crossed my desk (thanks to the great folks at Andrews McMeel Universal for the copy), I got to thinking that it might not be so bad to eat a zombie now and then. A cake zombie that is. This book is equal parts love letter to zombies and manual for making great cupcakes. Recipes are introduced with zombie trivia questions (I was dismayed to see how many I got wrong…) and the designs themselves pay homage to many popular zombie myths, including the T-virus from Resident Evil, baseball bats for zombie bashing, and, of course, step-by-step instructions for how to make brains delicious enough for zombies and children alike. Recipes start with decorations and the basics including how to make royal icing, blood colored gel, teeth, crosses, maggots and the aforementioned baseball bats. Then the book goes on to give 16 different recipes ranging from Toxic Bite to Zombies Rising to my personal favorite, Bride and Groom (see the cover above.) What’s even more impressive is the cupcakes aren’t just pretty to look at, they’re also delicious to eat with their assortment of frostings and fillings. Even better, author Zilly Rosen obviously had would-be/wannabe/never-was cupcake designers like myself in mind when she wrote the book because the illustrations and techniques are simple enough that I think I could even make these cupcakes. The budget for the Thriller video was $500,000, which in those days I bet was HUGE money. This book gets high marks for three things. First, it’s passion. Either Zilly herself or someone involved in making this book loved zombies. That much is obvious because the book is so much fun to read. Two, the visuals in the book are great. You know when you’re dealing with zombies, there’s going to be gore involved and this book doesn’t fail to deliver (for instance the Eye Popper recipe is very disturbing.) Still, it’s not so gross I wouldn’t show my kids or eat one of the cupcakes if they were served to me. Three, the ease-of-use of the book. Literally, the illustrations of how to make the feet, eyes, zombie brides, etc. are fantastic and very userfriendly. I thought the book was over before it was done. There’s a lot of creativity in the pages and I’m sure with all the work that went into making the book great that expanding it would have been difficult or even cost prohibitive, but I just wanted more. I’m not saying the book isn’t worth it’s price tag or anything, I just wanted to see more ideas and more zombie gruesomeness. If you like decorating cupcakes or if you want to be good at it, this is a great book. While the techniques focus on zombies, I have no doubt that they couldn’t work for other things, too. So, I was lucky enough to receive an copy of Natalie Bovis’ (aka The Liquid Muse aka the person responsible for getting me into blogging) new cookbook Edible Cocktails: From Garden to Glass – Seasonal Cocktails with a Fresh Twist and am I impressed. I’m not much of a mixologist, in fact most of my at-home mixed drink making involves a one second pour of vokda or gin and filling my glass with soda, but I know a good cookbook when I see one. And when I see Edible Cocktails, I see one. The premise behind Edible Cocktails is simple: take everything that’s great about farm-to-table dining and apply it to mixology. Organic produce, Slow Food (er Cocktails), growing your own ingredients, it’s all in there, but for cocktails. It’s not something I had thought of, but it makes so much sense. If I want only the best, freshest, most-carefully-raised produce in my dinner, why not in my drinks as well? If I care about the tomatoes that go into my marinara, why not the tomatoes in my bloody mary? If I care about the herbs on my roast chicken, why am I not striving for the same in my mojito? To make this vision reality, Edible Cocktails gives you a wealth of information about what you can grow at home, basics on how to grow them, and a full rundown of the different types of liquor and tools you will use to make excellent drinks. Oh, and there are recipes. Lots of recipes! They range from classic martinis to sours to pizza slice cocktails to bacon cherry creek cocktails…and that’s just the drink recipes. There are syrup recipes, mezcal recipes (chorizo mezcal anyone??? ), garnishes, and instructions on making your own liqueurs, like homemade Irish cream–all of which keep the focus on farm to table cooking and mixing. That’s pretty sweet. One, whisky and whiskey are both proper spellings of the hard alcohol. However, whisky applies mainly to Scotch and whiskey to everything else, including American bourbon. Edible Cocktails is filled with information, but it’s not a textbook. The photos are gorgeous and the layout makes absorbing all of Natalie’s information easy. It never feels like this book is an info dump. It’s more like a conversation with a good friend who just happens to know how to mix a fantastic drink. No pun intended, but I wish there had been more conversation around using meat and raw eggs in cocktails. I have this feeling that Natalie is perfectly fine drinking an infused liquor that has had meat in it or a drink with a raw egg, but I’m going to go out on a limb and say that a lot of American audiences (myself included) are not. We need to be warmed on the subject, given reassurances, and given more tips on how to avoid foodbourne illness. With that said, this is a great cookbook. Edible Cocktails is very clever idea whose time has come and who better to help us through it than bar industry veteran, multiple mixology cookbook writer, and long time cocktail blogger Natalie Bovis? Well, that title pretty much sums it all up. But, brevity has never been one of my strong points. I wanted to take a minute to give a huge shout out to Chef Jasper of Jasper’s Restaurant in Kansas City, MO, who got to feed the first lady his unique brand of classic Italian dishes inspired by foods produced right here in town and ingredients from his home town. I’ve seen the menu (Boulevard Pale Ale Lobster Mac & Cheese, which was previewed in a slightly different form at the Chocolate Experience), Louisberg Cider Glazed Guanciale, Chilled Leek and Roasted Cauliflower Soup with Garlic Chives, local roasted chicken and on and on the menu goes. My only regret is that Ms. Obama did not get to sit down at the legendary Kansas City restaurant where, undoubtedly she would have experienced what it meant to be Jasper’s full, but oh well. From the looks of it, I am sure she got a decadent meal. Anyway, keep up the good work. And if you want to have a Presidential Experience and let us taste some of the creations on your menu, Chef Jasper, you know I’m okay with that! Chef Terry Mille of Cowtown Cheesecakes was also on hand to serve his CowTown Sweet Potato Cheesecake Missouri Praline Bourbon Drizzle. So that’s two chefs I am seriously proud of. Anyway, congrats to all! You all deserve it. This year’s take included Diced Tomatoes, Diced Tomatoes with Basil, Garlic & Oregano, and other edible masterpieces. Woot! Every now and then, I still get this question. Yes, I use canned tomatoes. Yes, I swear by them. Me and Mario Batali both. (You may have heard of him.) Why you may ask? Largely it’s a convenience thing. I can halve my own tomatoes, deseed them, roast them, and puree them to make a sauce that’s pretty much better than anything in a can. However, that process takes at least an hour and the result, while good, doesn’t justify the additional time. Besides, just because I can pull out the stops and make something amazing doesn’t mean that canned tomatoes aren’t great. It does mean that if I was a purest and only ate homemade, there’d by no quick-and-easy spaghetti dinners on busy school nights. Does Red Gold Make a Difference? All of which means that when you’re shopping around, you should really give the yellow-labeled Red Gold tomatoes a shot. I think you’ll find that the finished product really does turn out better, whether you’re making Swiss steak, spaghetti sauce or a big pot of delicious chili. Okay, so the title is a bit forward-looking since the contest is Friday, but I’m a “fake it until you make it kind of guy.” Still, I’ve made this before and it’s a crowd pleaser. In a soup pot over medium-high heat, add the olive oil and let it get very hot. Add the onion, a pinch of salt and the garlic, then saute until the onions turn translucent, about 8 minutes. Next, add the ground beef, oregano, and black pepper and brown the ground beef. Once brown, add the diced tomatoes and their juice. Cook for about four minutes, or until the juice starts to thicken. Add the chipotles, adobo sauce, and beef stock and continue cooking until it the liquid in the pot is reduced by about half. Finally, add the chocolate and the rest of the ingredients. Stir to melt the chocolate. The chili is ready when it begins to bubble. Okay, that’s my award winning Red Gold chili. Eat and enjoy! Thanks to Red Gold for the image.